This is my last weekend to prepare Junebug for the big reveal party taking place next Friday, September 12th. I have already received quite a few RSVPs because everyone is excited to see the finished product! Luckily today is my Friday off, so I have three days to work on everything which should be plenty of time. Last Tuesday, I had an electrician from RV Masters come out to take a look at my wiring job. The only problem left was that the ground wire inside of the fixture above the bed had broken off (it was a really cheap fixture). Once he added a new ground, everything worked perfectly! I knew that was probably what was causing the fixture to be electrified, but I had gotten so frustrated last weekend, that I decided I had better just get an electrician out here either way, just to double check my work. He said that everything else looked good, so I was excited that I passed the test! After he was finished checking my interior wiring, he wanted to take a look at my taillights. I am still having trouble with them, the side running lights and license plate light don’t work when hooked up to my VW. He said some mean things about the two guys who had messed with the wiring both on my car and on my camper. All of these guys I’ve worked with think they are better than everyone else who works on trailers! I guess they are all competitors so they can’t like each other. haha He initially thought it was how my VW was wired. We checked it and that wasn’t the case. He then determined it was Junebug due to a grounding issue. He inspected the taillights because the side running lights were brand new. He thought the taillights were too old and weren’t getting a good ground or a good connection with the bulbs. So…I had to order new taillights. Luckily, www.vintagetrailersupply.com has reproduction taillights that are exactly like the ones I have so the look with be the same. The bad part is that they cost $120 with shipping. ugh They are supposed to arrive on Tuesday, and I’m going to try to install them myself first and see if that fixes the problem. If it doesn’t, then I’m going to have to rewire the taillights to ensure they are getting a better ground connection. Fingers crossed I can fish the wires out from behind the skin, insulation, and wood where I wedged them before so that they wouldn’t be compromised! So, back to what I need to do this weekend. I figured it would help me to make a list of everything to help me plan. Move exterior plug to a better location and add j-box under the fridge to connect it to the interior wiring so that no wires are exposed to the elements. Patch other hole in floor. Ok, I guess I’d better quit writing and get to work! Lots of things still to do, but I think it’s manageable. I’ll write another update tonight. 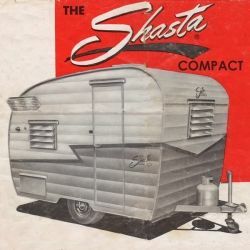 I’ll leave you with this original ad from the early 1960s for the Shasta Compact. Posted in 1961 Shasta Restoration Project and tagged 1961, 1961 Shasta Compact, canned ham trailers, DIY, glampers, glamping, Hobby, Houston, Junebug, projects, renovation, renovation projects, restoration, RV, Shasta camper, Shasta Compact, Sisters on the fly, Tin Can Tourist, travel trailers, Vintage Camper Rally, vintage camper restoration, vintage campers, vintage Shasta, Vintage Trailer Supply. Bookmark the permalink.